Alright then. 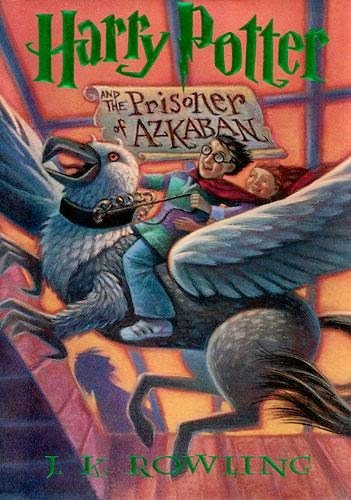 I've made it through the third book in the Harry Potter series, Harry Potter and the Prisoner of Azkaban . It was, by far, the most entertaining title yet, and equally the most disturbing. I am very curious to see how this series plays out (careful not to spoil it for me, please!) but at the same time, I'm baffled as to how this series became so popular. I both know and don't know how this came to be. Harry Potter and the Prisoner of Azkaban picks up towards the tail end of a summer break right before the start of Harry's third year at Hogwarts School of Witchcraft and Wizardry. The central plot in this tale focuses on a wizard by the name of Sirus Black, the man said to be most loyal to the Dark Lord, He-Who-Shall-Not-Be-Named (i.e., Voldemort). Black is considered a threat to the wizarding world and - quite possibly - the world at large. Black was being held at Azkaban prison but escaped and it is believed that he has been making his way to Hogwarts to do harm to Harry Potter. It's a very exciting adventure story with mysteries on every page. As is the case with the first and second Harry Potter books, this one leaves the reader dangling as to past and future mysteries. Each title in this series is just one puzzle piece and you clearly will need to read all in order to understand who Harry Potter really is and what is going on in the wizarding world. "When you come into the land that the Lord your God is giving you, you shall not learn to follow the abominable practices of those nations. There shall not be found among you anyone who burns his son or his daughter as an offering, anyone who practices divination or tells fortunes or interprets omens, or a sorcerer or a charmer or a medium or a necromancer or one who inquires of the dead, for whoever does these things is an abomination to the Lord. And because of these abominations the Lord your God is driving them out before you." Manasseh was twelve years old when he began to reign, and he reigned fifty-five years in Jerusalem. His mother's name was Hephzibah. And he did what was evil in the sight of the Lord, according to the despicable practices of the nations whom the Lord drove out before the people of Israel. For he rebuilt the high places that Hezekiah his father had destroyed, and he erected altars for Baal and made an Asherah, bas Ahab king of Israel had done, and worshiped all the host of heaven and served them. And he built altars in the house of the Lord, of which the Lord had said, “In Jerusalem will I put my name.” And he built altars for all the host of heaven in the two courts of the house of the Lord. And he burned his son as an offering1 and used fortune-telling and omens and dealt with mediums and with necromancers. He did much evil in the sight of the Lord, provoking him to anger. And the carved image of Asherah that he had made he set in the house of which the Lord said to David and to Solomon his son, “In this house, and in Jerusalem, which I have chosen out of all the tribes of Israel, I will put my name forever. And I will not cause the feet of Israel to wander anymore out of the land that I gave to their fathers, if only they will be careful to do according to all that I have commanded them, and according to all the Law that my servant Moses commanded them.” But they did not listen, and Manasseh led them astray to do more evil than the nations had done whom the Lord destroyed before the people of Israel. Yes, both of these references are from the Old Testament but I don't find that the new covenant wiped any of these requirements out. I believe the command to abstain from divination still holds true because God is still God and the only source of wisdom we should be looking to and/or worshiping as we proceed about our lives. The practice of divination was not just a cultural thing but was directly linked to the worship of a god, or God Himself. I would personally suggest running in the opposite direction at the mere suggestion that divination might be a good idea to solving anything. It seems risky business to assume otherwise. Yes, you might say that Professor Trelawney is presented as something of a nit-wit and the subject of divination presented in a farcical light. To that I would remark with a smile upon my face, "Well, how convenient then. So long as its done in a silly manner I'll let it slide. Ha! Ha!" And then you'd have to know that sometimes when I smile I'm being really sarcastic. I can't get away from the fact that God doesn't make a joke out of the idea of practicing divination. To Him it does not seem to be a laughing manner; it seems to be quite serious. Even if Trelawney is a goof head, Potter and his friends are still required to learn and practice the dark art and, again, that isn't something that I can sweep past with or without a wink and a nod. It's a problem and you can't make it go away. It's there to be dealt with. So how am I, personally, dealing with it? Well, I bought Book 4 if you were curious. I'm totally "in" to see how this series plays out. I'm a little alarmed by the fact that these books are being presented as innocent diversions and plain good fun. It's fun in the sense that there is mystery and likable characters. (I do like Potter and Hermione is a hoot.) I want to know how it ends. But I find that I have to move slowly and carefully even then. It's not just a bit of light reading because of the materials contained in the stories. I don't want the idea of dark magic and witchcraft to be something that my children read about without a "check in their spirit" creeping up. I sort of feel about Potter the same way I do about The Hunger Games (read those thoughts if you just can't get enough of me not thinking like the rest of culture, ha). Yes, they are wildly curious stories. Rowling is a good story teller who pieces things together in a way that leaves you hankering to find out what's going to happen next. But being a good story teller and weaving an interesting tale doesn't mean that we can just drink it in without questioning the effects and discussing it a little. It just doesn't sit well with me that it's entertainment because there are themes inside these stories which demand conversation and demand us sometimes (more frequently than not?) standing up to an idea enclosed in these books and using the actual words, "This is not right. This should not happen." Divination is not right. It should not happen. We cannot pretend that the Bible says anything but and, if anything, we should be scared out of our minds to think that it's something that we can pat on the shoulder and say, "Well, it's sort of cute here." In the case of Potter I know conversations are being had regarding whether or not we ought to be reading them. Those conversations are good and should not be resented. God took the idea of divination seriously so I think it's justifiable (and proper) that we ought to do the same. It's not a subject that God found to be all fun and games. Let people talk about it. It's good for them; it's good for you. Some Christians want you to think that you can know God through Potter. I just don't see how that is possible. Still other Christians won't touch Potter with a 100 foot pole. Let's just say that, at the present, I stand somewhere in the middle. I can't love Potter like I love Narnia because Rowling has distorted truth; truth is excessively unclear (especially, I would imagine, to younger readers who are devouring these works). I won't eat Potter and say it is good; neither will I eat it and say it is purely filth. However, I will proceed with caution and I won't be able to take Potter lightly. You might find that you can enjoy him (I can) but also that - just perhaps - speaking as a Christian, it might not be in your best interest to spend a great deal of time with him. To put that another way, I think Christians can be free to read this but I honestly don't necessarily know why they would want to. And now onto Book 4. Because, yes, I am going to see this through to the end. I never understood those who thought you could know God better through Potter. These are not Narnia and weren't designed to be Narnia. There are themes of good vs. evil and other universal themes in them, but the same can be said of Star Wars. And again, they are good stories but not something we can get Scriptural truths from. Having said that, I didn't take the magic part as seriously as you do. That's a failing on my part, and you are correct to do so. And they are very good stories. I might come back and share thoughts later but wanted to share what my husband said... "if she thought book three was disturbing, book four gets progressively darker." He did not finish the series due to time constraints but is considering finishing it. I have not read any of it. I am holding my tongue because I want to hear your thoughts first! I'll wait til after you've read Book Four....... And then boom! A year or so ago, I remember you objecting to the magic in the stories, and I kind of wondered why traveling through a chimney flue or on a magic bus or having a self-cleaning kitchen was viewed as morally problematic. If anything, the chimney flue travel reminded me of the risen Christ. But I can see where divination falls into a different category than "nonstandard travel methods". I read all these while I was pumping for the twins. (Well-used library copies that stayed open with no hands) They get darker. @Sky - I'm waiting for your BOOM. :D haha!! I think, who am I kidding, I know I fall into the category of "wouldn't touch them with a 100 ft. pole". Because of the topics in them I have absolutely no desire to read them, fictional or not. Too many other books that are calling my name. That being said I do like to read your reviews of them. I just love this review. Historically, I've had no problem with Potter. That said, I haven't read the books! I've only seen the movies. ;) I really appreciate the thought that has gone into this review. Thank you!